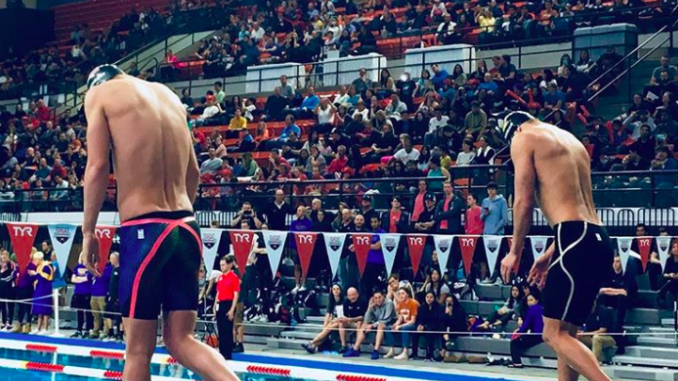 The final night of action from the 2018 TYR Pro Swim Series at Austin was a really long one but it debuted new events with the 50 shootouts and the Mystery IM. 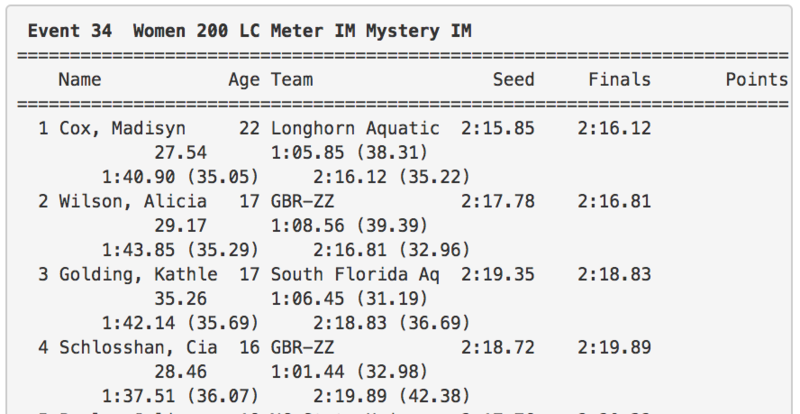 The new Mystery IM events, where the swimmers don’t know the order of the 200 IM until they are behind the blocks debuted tonight as well. Those events and formats are a new edition to the TYR Pro Swim Series this year. Sprint sensation Michael Andrew got his busy night started with a leading time in the 50 free semis. Andrew swam a 22.12 just ahead of Nathan Adrian (22.54) as those two will swim again later on in the session in the final. Nathan Adrian got his hand on the wall first in the semi-finals of the men’s 50 free as he was 0.01 ahead of Michael Andrew in the semi-finals. 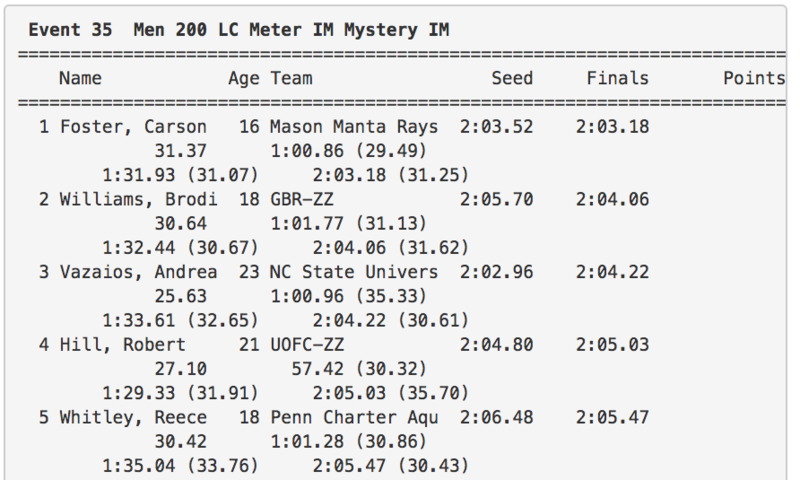 Adrian swam a 22.08 to Andrew’s 22.09 as the final will be a huge grudge match between the two. Adrian improved three tenths on his quarter-final time as both swimmer’s aerobic base will be put to the test in the final in a few minutes. 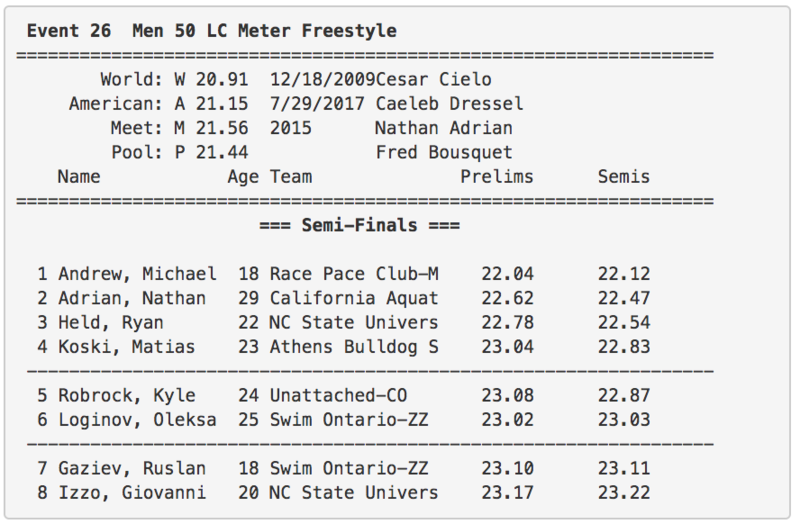 Veteran Nathan Adrian still has it in him against 18-year-old Michael Andrew as the 29-year-old Adrian swam a 22.21 to win the shootout final ahead of Andrew (22.34). Both swimmers were slower in the final as Adrian was a 22.47 in the quarters and a 22.08 in the semis. He swam a little slower the third time around but still hung on for the win. Both swimmers were separated by a hundredth after the semis. Andrew also swam slower in the final after he went 22.12 in the quarters and 22.09 in the semis. He will also have to swim in the 50 fly shootout later on in the session. Michael Andrew left, Nathan Adrian right. 50 Free shootout. Michael Andrew is looking to redeem himself after losing to Nathan Adrian earlier in the 50 free shootout final. Andrew leads the 50 fly quarters with a 23.75 ahead of Texas’ Jack Conger (23.90) swimming in his home pool. Ryan Held (23.94) and Paul Le (24.24) will join them in the semi finals later on. Michael Andrew is headed to another final as he tied for the top spot in the 50 fly with Jack Conger (23.59). Conger is swimming in his home pool and will be looking to win another event on the weekend after taking out the 100 fly on Thursday. Andrew is still looking for his first win of the meet. This is almost deja vu for Andrew after he was 0.01 behind Nathan Adrian after the 50 free semis. He will be looking for a better result this time. 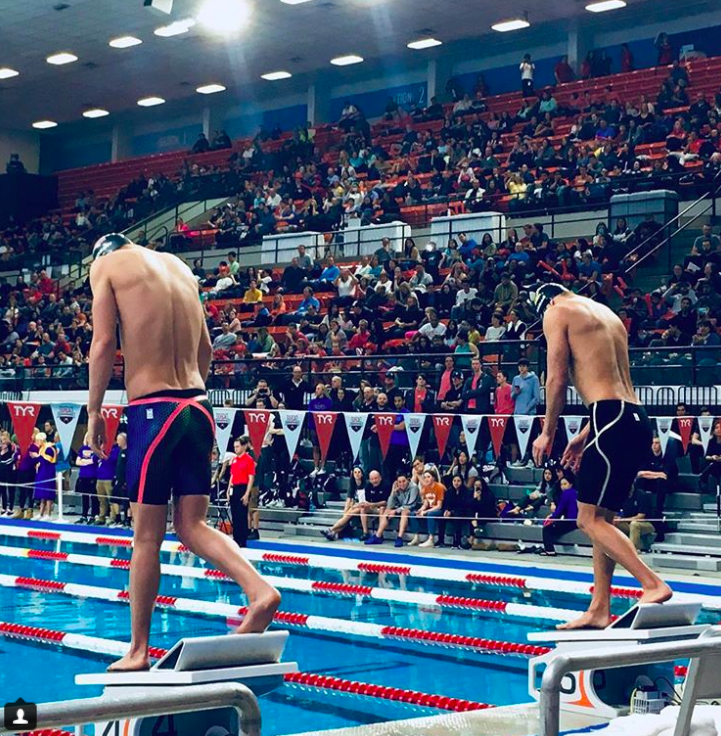 Swimming in his home pool, Jack Conger out-raced Michael Andrew in the 50 fly the third time around on Saturday night in Austin at the TYR Pro Swim Series. Conger won the final race of the night with a 23.37 ahead of Andrew’s 23.43. Conger descended from a 23.90 to a 23.59. Both swimmers were tied after the semi-finals and the final was expected to be pretty much a shootout. Pun intended. Conger held off Andrew to give him his second loss of the night after the latter lost to Nathan Adrian in the 50 free final. Both swimmers scored points for Kaitlin Sandeno‘s swim squad. The first ever Mystery IM events at the TYR Pro Swim Series were claimed by Madisyn Cox and Carson Foster at the Pro Swim Series in Austin. Cox won her race at 2:16.12 and Foster won the men’s race at 2:03.18. Cox finished her race with backstroke as she had freestyle, breaststroke, butterfly and back. Cox finished ahead of Alicia Wilson (2:16.81) and Kathleen Golding (2:18.83). Swimmers would draw their lane assignment that had the designated stroke order written on the board behind their block. Most swimmers had different stroke orders so the lead changed multiple times throughout each race. The men’s race was won by Foster who swam breaststroke, freestyle, butterfly and backstroke as he won with a 2:03.18 ahead of Britain’s Brodie Williams (2:04.06) and NC State’s Andreas Vazaios (2:04.22).